It felt so good to be back in the classroom today! I taught my Bargello Placemats quilting class and had some familiar faces (previous students) and made new friends, too. 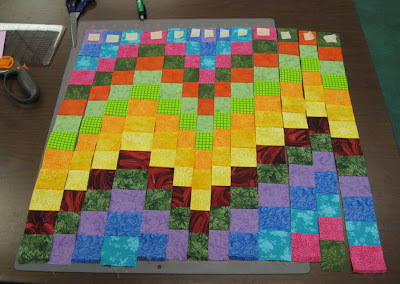 Quilted Bargello placemats class project. To provide an overview of Bargello, I started class with a brief multimedia presentation using my iPad. Did you know that the term, Bargello [sounds like bar-jello], originated from the Bargello palace, or fortified castle, that was a barracks and 13th century "police station" in Florence, Italy? The Bargello palace, now an art museum, has a collection of 17th century chairs with seats and backs done in the "Hungarian point" technique in the flame stitch pattern. 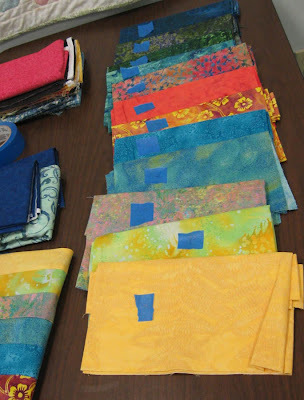 Auditioning and arranging the fabrics. 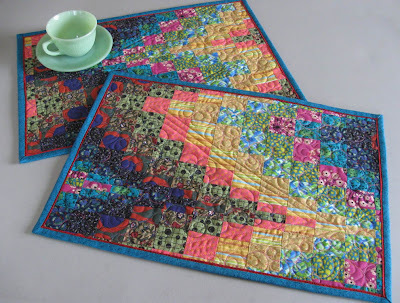 Bargello needlepoint had a resurgence in the 1960s. 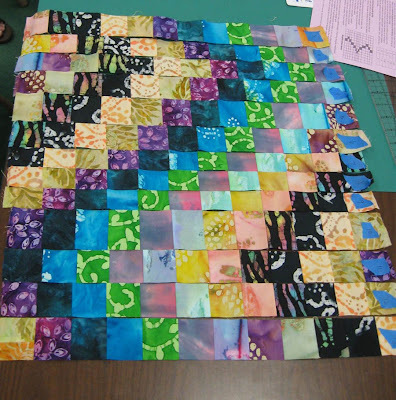 Then the technique emerged in the quilting field and offers amazing design and pattern possibilities for quilters. For our Bargello placemats, the fabrics are first auditioned and arranged in a pleasing sequence of colors and values. After strip piecing and sub-cutting, the Bargello pattern emerges. Color and value are two of the Elements of Design (along with line, shape, form and texture). 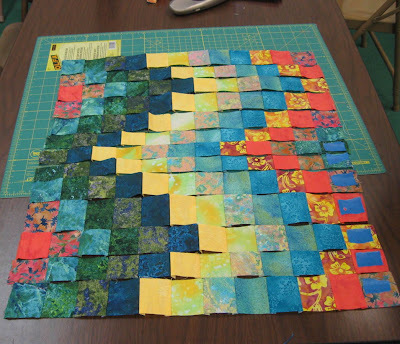 Bargello is another technique for honing your color and value skills. The more you work with color and value, the more confident you will become. Here are Bargello layouts for my students' projects. They were all successful with their color and value choices. The designs are smashing! soft yellow makes a dramatic statement. This Bargello pattern has three distinct paths. complementary color combination adds energy to the layout. I'm teaching a private Bargello Placemats class in two weeks. I can't wait to see the designs from these students. Love this idea! I'd like to use the same materials/process, but they would have to be kid-proof,LOL! What would you suggest I use to seal the placemats so that they can be wiped down easily after a meal? My Fabric Rep Trek: Sewing Machines Etc.